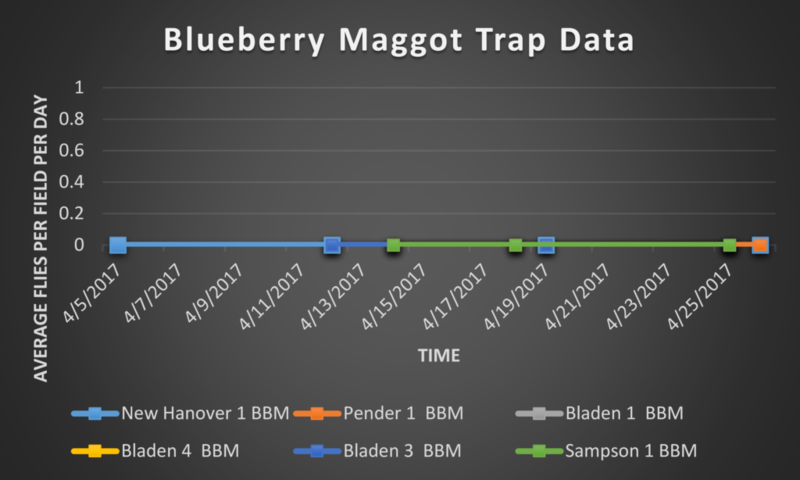 As we continue our weekly blueberry insect monitoring, the cherry fruitworm moth flight appears to be over as we saw no cherry fruitworm moths in the traps. We are, however, observing the early stages of cherry fruitworm damage in some locations. Cherry fruitworm larvae damage 1-2 fruit per cluster. They tunnel into one berry upon hatching and then, when they grow larger, they move to an adjacent fruit. The first damaged fruit will often ripen prematurely, and the two berries will be stuck together by the tunnel. 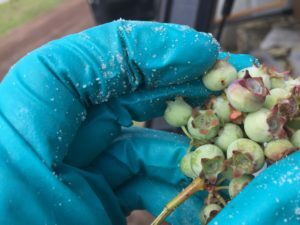 When cherry fruitworm damage manifests early in the growing season, damaged fruit often fall off the bush before harvest. 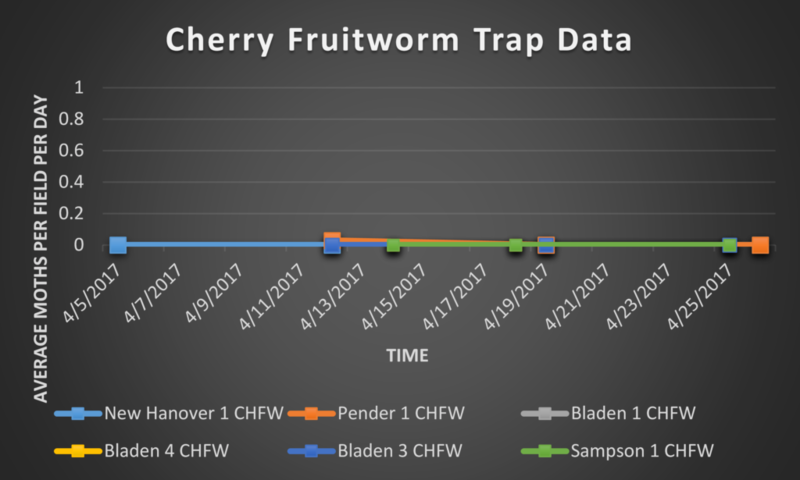 Cherry fruitworm is a more significant concern when late populations attack fruit, resulting in larvae present at harvest. Cherry fruitworm damaged berry. Note the hole in a single fruit. Photo: Grant Palmer. 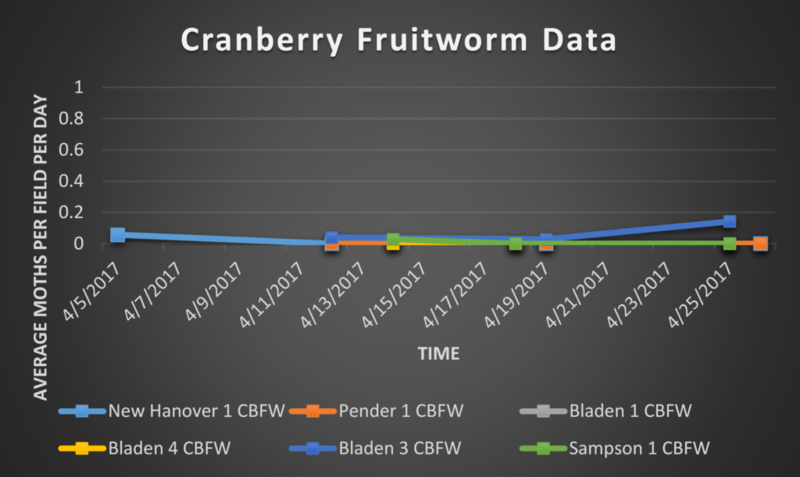 While the cherry fruitworm flight looks to be over, the cranberry fruitworm flight is still under way. We captured a total of 5 cranberry fruitworm moths at one of our monitoring sites, but we have yet to see any cranberry fruitworm feeding in fruit. 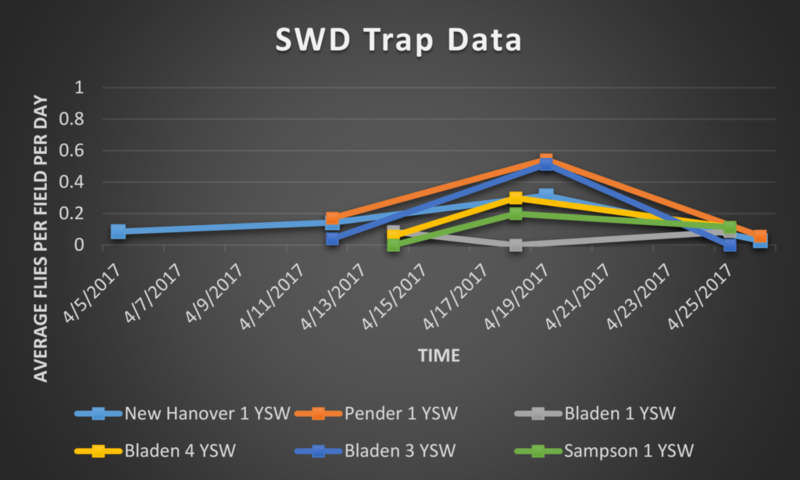 During this trapping period, 1 SWD was captured at New Hanover 1, 2 SWD were captured at Pender 1, 0 SWD were captured at Bladen 3, 3 SWD were captured at Bladen 1, 4 SWD were captured at Bladen 4, and 4 SWD were captured at Sampson 1. During this trapping period, 5 cranberry fruitworm moths were captured at Bladen 3.